This ruling plays off of the 2012 decision in Miller v. Alabama, which struck down mandatory life terms without parole for juveniles. This now must be applied retroactively and could affect at least 1,000 inmates in similar situations across the country. In this episode of Lawyer 2 Lawyer, host Bob Ambrogi joins Emily C. Keller, a supervising attorney at Juvenile Law Center, and professor Christopher Slobogin from Vanderbilt Law School as they look at the recent Supreme Court decision, inside Montgomery v. Louisiana and Miller v. Alabama, the impact on past and future cases involving juveniles, the decision’s impact on the families of victims and juvenile justice reform. Emily C. Keller engages in litigation and policy efforts to improve the child welfare and justice systems, including efforts to eliminate juvenile life without parole. Emily served as co-counsel for Henry Montgomery in Montgomery v. Louisiana before the U.S. Supreme Court and co-authored an amicus brief in Miller v. Alabama, the U.S. Supreme Court’s 2012 case banning mandatory life without parole sentences for juveniles. Emily has also submitted amicus briefs in cases around the country challenging the imposition of life without parole and other extreme sentences on juvenile offenders. Professor Christopher Slobogin occupies the Milton Underwood Chair at Vanderbilt Law School, where he directs the criminal justice program. He has authored several books, including Juveniles at Risk: A Plea for Preventive Justice, published by Oxford University Press. Intro: There are thousands of people serving sentences for two years, many for decades, who now have the benefit thanks to Montgomery v. Louisiana of having their sentence looked at again. The logic of Graham and Miller and Montgomery is that there has to be a periodic review of incorrigibility, risk, rehabilitation, or there could be a constitution of violation. 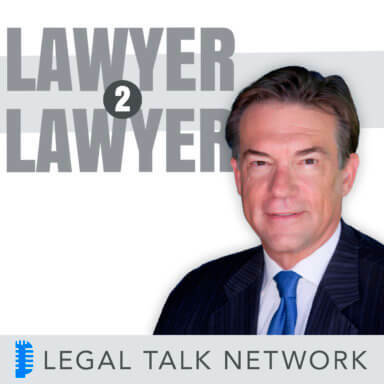 Bob Ambrogi: Hello and welcome to Lawyer 2 Lawyer on the Legal Talk Network. This is Bob Ambrogi coming to from just outside of Boston, Massachusetts. I write a blog there called Lawsites. My co host, J. Craig Williams, is unable to be with us today; he was just called into court on an issue. Before we introduce today’s topic, let me take a moment to thank our sponsor, Clio. Clio is the online practice management platform for lawyers. You can find out more about Clio at www.GoClio.com. One other quick announcement before we begin today’s show, we want to let you know that the Legal Talk Network has just relaunched the podcast, Law Technology Now, and co hosting that is Monica Bay, the longtime editor of Law Technology News and American Lawyer Media and now a fellow with the Kodex at Stanford Law School and yours truly. We’re going to explore the latest in legal technology and so much more there. So we’ve got about 3 episodes of that up now and look for Law Technology Now on the Legal Talk Network. On January 25th, in a 6 to 3 opinion written by Justice Kennedy, the Supreme Court ruled that those sentences juveniles to mandatory life and imprisonment for murder should have a chance to be resentenced or argued for parole. The ruling plays off the 2012 decision in Miller v. Alabama which struck down mandatory life terms without parole for juveniles. That opinion must now be applied now retroactively and could affect at least a thousand inmates in similar situations around the country. This most recent case is Montgomery v. Louisiana and here to discuss it with us and allow us to talk more about the implications of this case are two guests who are well versed in it. First of all, let me welcome to the show, Emily C. Keller. Emily is a supervising attorney at the Juvenile Law Center in Philadelphia where she engages in litigation and policy efforts to improve the child welfare and justice systems, including efforts to eliminate juvenile life without parole. Emily served as co-counsel for Henry Montgomery in Montgomery v. Louisiana before the U.S. Supreme Court and she co-authored an amicus brief in Miller v. Alabama, in the 2012 case we mentioned before. She submitted amicus briefs in cases around the country challenging the imposition of life without parole and other extreme sentences on juvenile offenders. Welcome to Lawyer 2 Lawyer Emily Keller. Emily C. Keller: Thank you so much for having me. Bob Ambrogi: Also joining us today is Professor Christopher Slobogin. Christopher holds the Milton Underwood Chair at Vanderbilt Law School where he directs the criminal justice program. He has authored several books, including Juveniles at Risk: A Plea for Preventive Justice, published by Oxford University Press. Welcome to Lawyer 2 Lawyer Christopher Slobogin. Professor Christopher Slobogin: Thank you for having me. Bob Ambrogi: And I also wanted to add that a third guest, Charles Stinson from the Heritage Foundation, was scheduled to be with us today but he could not make the show because of a last minute scheduling change and we’re hoping to be able to have him join us for a future show to talk more about this important topic. So, Emily Keller, let me start with you. I wonder if you could just give us the background of this case and tell us more about Mr. Montgomery and the case that brought him to the Supreme Court. Emily C. Keller: Sure. So Henry Montgomery was convicted of a homicide offense for a crime that occurred in 1963 when he was 17 years old. He was convicted of shooting and killing a sheriff’s deputy. So for the last half century, he has lived in prison and in a lot of ways grown up in prison. He actually initially received the death penalty, but Mr. Montgomery was an African American youth who was convicted of killing a white sheriff’s deputy. Given the racial tension at the time, the death penalty was taken off the table and he was resentenced to life without parole. At the time of his sentencing, there was no other sentence available, there wasn’t a lesser sentence that he could receive. So he couldn’t show any evidence that should suggest that he should have the chance to be released from prison. So he has served, like I said, over a decade at Angola Prison in Louisiana, which has starkly been a very violent prison, a huge prison, and that’s where he’s grown up. But over the course of the past half century, he’s also made a lot of his life. He was really involved in founding an athletic club and really tried to be a mentor to other young inmates who are coming in; has worked a steady job within the context of that prison facility, and really had no hope of release until in 2012, the US Supreme Court in Miller v. Alabama held that these mandatory sentences for juveniles are unconstitutional. The kids have to have an opportunity to present litigation to show that they are less culpable and shouldn’t have this harshest available sentence. And he on his own filed a petition to Louisiana state courts, at which point the Louisiana Supreme Court said that Miller doesn’t apply retroactively, that it only applied to the new cases in 2012 and the cases going forward. Then the US Supreme Court decided to hear the case and address this question of whether or not Miller just applied to new cases or whether under the constitution it has to apply to everybody. There are thousands of people who have been serving sentences for a few years, many for decades, who now have the benefit thanks to Montgomery v. Louisiana of having their sentence looked at again when the Supreme Court held that Miller does apply retroactively. Bob Ambrogi: Christopher, let me just bring you into this conversation and maybe you can give us your impression of just what the Supreme Court has done here in Montgomery v. Louisiana. Emily has set the stage for what the court did. Perhaps fill us in a little bit more on what the holding was here. Professor Christopher Slobogin: Sure. Well first of all, I want to congratulate Emily for success in the Montgomery case. I think it’s a fantastic victory for juveniles and it is a very consequential one because Emily stated it does mean that Miller applies retroactively and the retroactive remedy is to allow juveniles either to be resentenced or receive a parole hearing. And that gives juveniles – people who are convicted as juveniles, obviously most of them are adults now – it gives them an opportunity to show to a court that they have been rehabilitated, they’re not the way they were at the time of their offense. They’re either not as culpable or their character has changed or they become law abiding citizens as Mr. Montgomery is attempting to show. And I think of it as an exciting development, because that means that there’s at least a chance for people who are convicted as juveniles and given life without parole sentences that they will be able to be released from prison because they no longer meet the criterias of Montgomery and Graham and in Miller. Bob Ambrogi: Has the court said here that life without parole is always unconstitutional for a juvenile? Or if not, what has it said? Professor Christopher Slobogin: It has held that juveniles have the opportunity to show that they are eligible for parole for release, but it is perfectly possible for a person who is convicted as a juvenile to fail which would mean they may end up in prison for the rest of their life. But at least they get the parole hearing. At least they get a hearing on the issue on whether they should be released. And certainly, there are many people who are convicted as juveniles who are serving life without parole sentences. One estimate is upwards of up to 2,000 who probably can make that kind of showing, at least if a court gives them a fair hearing. Because many of them have been in prison for 10, 20, 30 years, certainly they’ve changed dramatically in those years. They’ve matured, they may have gone through rehabilitation programs. They may have rethought of their offending ways. And again, if the court gives them a fair hearing, there’s a good chance they will have an opportunity for being released. Emily C. Keller: I just want to emphasize that the Miller decision and the Montgomery Decision were very clear that permissible occasions for a life without parole sentences for juvenile offenders should be really rare and uncommon. Justice Kennedy and the Montgomery decision said that life without the possibility of parole would only be permissible for the rare offender who displayed permanent incordiability. And as Christopher said, most people that have been serving these sentences have really developed a record of rehabilitation and in the natural growth and maturation process. Even in bars and in prison have really been able to grow into thoughtful, compassionate, remorseful adults who really want a chance to give back and to contribute to society. So these decisions really rested on brain science and research about adolescent development that says that the actions that kids take when they’re adolescents are very different from the actions they would take as adults. They’re so much more impulsive, that they’re so much more influenced by their peers and their family situations. And really importantly, they’re so much more prone to be able to be rehabilitated, and it’s really the rare juvenile who won’t be able to be rehabilitated and be a productive, contributing member of society. Bob Ambrogi: For new sentencing cases going forward, does that finding of permanent incorrigibility have to be made at the time of sentencing or is that something the courts would need to revisit later in the course of a prison term? Emily C. Keller: Different states are handing the question differently. I think some states have passed new legislation that gives everyone a second look, either 15, 20 or 25 years later, or gives everyone a chance for parole after a certain number of years. But for states that still allow the possibility of a life without parole sentence, that would be a finding that would have to be made at the time of sentencing. It would be a prediction that the court would have to make looking at the circumstances of the offense of whether or not this person is one of those very rare people who is permanently incorrigible. Because Justice Kennedy was very clear that if the juvenile offender isn’t permanently incorrigible, the life without parole sentence is unconstitutional under the 8th amendment. Bob Ambrogi: Christopher, correct me if I’m wrong, but I read comments that you gave in a Washington Post article. Did I understand that you suggest that the next case might take this further if there’s a next case? That there are a couple of cases that would push this to sort of a flat constitutional standard of life without parole being always unconstitutional for a juvenile. Is that right? Professor Christopher Slobogin: Well certainly I think that could be the next stage in this litigation. I think we’ve seen a progression from Graham to Miller to Montgomery where the court has increasingly lapsed it’s previously categorial approach to 8th amendment jurisprudence. It’s now, after Montgomery, essential allowing individual life sentencing to take place and in fact requiring it to take place. And relevant to what Emily was saying, it is true that in some states, this finding of incorrigibility would have to be found at the front end sentencing proceeding. But I think that finding is impossible to make at the time a 17 year old is sentenced. And the logic of Graham and Miller and Montgomery is that there has to be a periodic review of the juvenile’s incorrigibility, risk, rehabilitation, or there could be a constitutional violation. And one other interesting aspect to all of these cases, obviously all these cases just deal with people who commit crimes while juveniles, but Emily mentioned brain science. Brain science makes very clear that up until about age 25, the brain is still maturing. So again, the logic of these cases suggest that there should also be parole opportunities, periodic reviews, even for people who commit crimes after the age of 18. Now that’s not going to happen right away, but I think there’s a foot in the door for that kind of argument under the 8th amendment because of the series of cases. Bob Ambrogi: That because the brain is not fully developed that the finding of permanent incorrigibility couldn’t be made at that point. Is that essentially what you’re saying? Professor Christopher Slobogin: Yes, that’s partly of what I’m saying is that it’s virtually impossible to declare that somebody is incorrigible for the rest of his life at the age of 17. There’s just no science that supports that proposition. Not only brain science contradicts that, but general psychological science. Everyone matures, everyone changes in character – at least a little bit – as they grow older, and it would be virtually impossible to declare somebody incorrigible, untreatable, unchangeable, at the age of 17. So I think the logic of Graham, Miller and Montgomery suggest that there has to be periodic review. And by that I mean not just the kind of one time hearing that Emily mentioned after 25 years or 20 years, but something more akin to the way parole used to operate. Period review every couple of years. Now again, this is not going to happen in the near future, but I think all of these cases have set the groundwork for that kind of legal regime. Bob Ambrogi: We need to take a short break, but before we move on to our next segment, we’re going to hear a few words from our sponsors. Stay with us, we’re going to be right back. Bob Ambrogi: Welcome back to Lawyer 2 Lawyer, this is Bob Ambrogi and with me today is attorney Emily Keller from the Juvenile Law Center in Philadelphia and Professor Christopher Slobogin from Vanderbilt Law School, where he directs the criminal justice program there and we’re talking about the Supreme Court’s recent decision of Montgomery v. Louisiana. At the point that we’re recording this, it’s just a few days after the news has broken of the death of Justice Scalia and the dissent in this case, Justice Scalia wrote a dissent in this case which in many ways had many of the classic characteristics I think we’ve come to hear about Justice Scalia dissent writing in part. He wrote, ”In godfather fashion, the majority makes state legislatures an offer they can’t refuse. Avoid all the utterly impossible nonsense we have required for sentencing juvenile homicide offenders by simply considering them for parole. Mission accomplished.” Emily, any thoughts on Justice Scalia’s dissent in this case? Emily C. Keller: So Justice Scalia has dissented in all of the cases relating to juvenile sentencing. But I think that the quote you just read ties nicely to what Christopher was saying before the break. But what Justice Scalia is predicting is by the virtue of these decisions that life without the possibility of parole is actually going to be taken off the table for juvenile offenders. His prediction of what the legislature would do, whether it’s legislatures that do that or the court that eventually does that, I think it is for the reason that Christopher is saying. If what you have to demonstrate at the outset is used as permanently incorrigible, the Supreme Court has also said in these sentencing cases that that’s a determination that actually you can’t make as an outset. You can’t look at a juvenile today and say “Are you going to be the more common teenager who will grow up and grow out of this behavior? Or are you going to be the rare offender who will continue these sorts of behaviors the rest of your life?” Looking at a young person today, you can’t make that prediction. So it does seem to be the direction the court is going and legislatures around the country are going as to say, “Let’s give everyone a chance for a second look, whether it’s parole and other hearings.” Again, if these young people aren’t growing up and rehabilitating, if it’s about parole opportunities, they’re probably not going to get out. But if they are rehabilitating and they are taking advantages of the programs being offered and really making those connections and wanting to give back to their community, they should have the chance to appear before a judge or a parole board and demonstrate that they’re ready and fit to be returned to society. Bob Ambrogi: Christopher, anything you want to add to that? Professor Christopher Slobogin: Yeah, first of all starting with the comment on Scalia. Whatever you thought of him, ideologically, he certainly did have a nice trend for phrase in most of the opinions he wrote. And his general approach to the juvenile cases was a general approach to constitutional jurisprudence at large. He had a real problem with the justices posing as what he calls philosopher kings. Subject declaring from on high, what state legislatures should be up to, the injusting aspect of the case we’re talking about now is that the court has gotten further and further away from what used to be the lowest jurisprudence what the various states were doing in the given area. So for instance, in the Adkins case that exempted people with intellectual disability from the death penalty, the court was able to say that roughly half the death penalty states and of course all the non death penalty states had already exempted people with intellectual disability from the death penalty. And then the rest of the court’s reading which was that people with intellectual disability are less culpable and less deterrable was sort of an add on. In Roper v. Simmons, which exempted juveniles from the death penalty could pretty much say the same thing. In Graham it wasn’t quite as easy to say that kind of thing. It wasn’t as easy to point to a ground level of legislation against life without parole. Same thing in Miller. And Montgomery moves even further away from the county methodology of delineating what the 8th amendment’s all about. And I think that must have been driving Justice Scalia crazy. Bob Ambrogi: I think in my opening, I said there were another thousand or so of these cases of these and I think I heard you say that there maybe are several thousand. What is the impact of this ruling? How many people are affected by this retroactively? Emily C. Keller: About 2,000 people nationwide serving these mandatory life without parole sentences for crimes that they committed when they were juveniles. I’m in Pennsylvania, there are 500 cases in Pennsylvania alone, including about 300 from one county, Philadelphia, Pennsylvania. But there’s a number of states that have really large populations like Pennsylvania, Michigan and Louisiana that have hundreds of these cases where they’re going to have to either get parole or get resentenced. And then there are states across the country, some states have a handful, some have a few dozen. But this is something that our colleagues around the country are grappling with. Both the defenders, the district attorneys, the court systems, the legislatures, trying to figure out the best mechanism for handling this number of cases. Bob Ambrogi: And what do you think is the best mechanism? Do you have a recommendation? Is your organization taking a position on how they should be handled? Emily C. Keller: Our main recommendation is that there needs to be an individualized process. There may be some states where the legislature will act and follow Justice Kennedy’s advice and just give everyone parole. But in states like Pennsylvania where that hasn’t happened, the legislatures in a lot of these states where even if they eventually do that may not do that quickly. And when you’re talking about folks that have been serving in some cases, 5 or 6 decades, there is an urgency to make sure that they’re getting a new sentence and a chance for release. And so for the most part, wha Miller really talked about is that these need to be really individualized and these sentences should be tailored to the culpability of the offender. And Miller was really talking about new cases and cases going forward. There were lots of factors that should be considered based on the young person and their circumstances at the time of the offense. And what Montgomery adds to the equation is not only should you look at who that young person was, but what were the circumstances that influenced their participation in the crime. Montgomery adds the fact that you should look at where the person is now and look at the progress that they’ve made and that that’s something else that really should be taken into account in determining what the right sentence is. Professor Christopher Slobogin: I would add to that. I don’t have a recommendation as to the best way to proceed after Montgomery, but I think it’s important to point out a couple of things. First of all, some states just don’t have a parole process. Somebody would have to come up with something else. And the parole process itself, in theory I think, could work out pretty well in states that have it except for the fact that at least in some states, parole is a very informal kind of process. It really doesn’t call for the kind of individualized assessment that Emily’s talking about. Or at least there’s not as much formal procedure connected to parole proceedings as there is, for instance, with the trial or even a sentencing proceeding where you’re going to have a much more adversarial kind of contest and lots more information can come out. So I would hope that most states will have a formalized open hearing in which the individualization process Emily was talking about occurs. And the last one I would make is Emily mentioned the idea that individuals should be able to show they were diminished in their culpability and that should be one grounds for gaining release and I agree with that. And certainly Graham, Montgomery and Miller all talk about that. But I would hope also that a major focus of these individualized hearings is whether the person has gone through the maturation process or rehabilitation process that makes it unlikely for them to reoffend. Because I think, actually, empirically, they’re much more likely to be able to show that at the age of 35 or 40 than they are to show that somehow their culpability has become diminished. Yes, it’s true, they’re now adults, they’re no longer juveniles, but that in some ways cuts against finding of lesser culpability and there’s no actual goal standard for culpability. A cork in say, someone’s culpable at a life sentence level without a second guess because there’s no way of second guessing that particular decision whereas there is a way of proving or disproving whether someone is high risk or low risk. If you look at some of the resentences of some of the juvenile cases that have already gone to the court, Simmons and Miller and Jackson who are the juveniles involved in the previous court decisions are serving extremely long sentences even though they won their cases. Why? Because the courts went back and said they’re still very culpable, they deserve very long sentences. On the other hand, they looked at whether they were high risk or low risk, whether they’re rehabilitated or not. I think there’s a much better chance of there being release at about the time parole has sought. And if you think that’s a good thing, then I think rehabilitation is a better focus than culpability. Bob Ambrogi: Are some of these prisoners likely to pursue habeas petitions while they’re waiting for their states to figure out how to handle it? Emily C. Keller: Especially in Pennsylvania, a lot have already filed federal habeas petitions, at least what we’ve heard so far is that the federal courts may wait. And now that there is a state abinanti for release again and give the state the first chance to get this right. Bob Ambrogi: I guess I’m wondering what’s next after this case and what are the longer term implications for this case beyond those that we’ve talked about? Are there any? I know we’ve talked about the possibility of the next case and we talked about what it might mean for sentencing decisions going forward. Is there any other significance to this case beyond what we’ve talked about here, Emily? Emily C. Keller: I think that there are a lot of implications for this case partly just in terms of this category of juvenile offenders. There are so many issues that for Miller and Montgomery to be meaningful, there may be a lot of litigation down the road. The warning from the Supreme Court or the finding from the Supreme Court that these should be rare and uncommon sentences hasn’t been born out in a lot of the cases that have been proceeding since Miller. There are a lot of people who are still getting juvenile life without parole sentences. So that challenge about striking down life without parole entirely for juvenile offenders I think may reach the court or may reach the legislatures around the state. Specifically for felony murder cases, there are a lot of people serving these sentences who weren’t even the killer, who were maybe the lookout or the driver or were part of a break in but were not armed or may not even have owned that their co defendant was armed. And in a lot of states, people convicted of felony murder also serving life without parole sentences. So that’s another place given what we know about adolescent development and their ability to foresee the consequences of their actions. That’s another case where there may be challenges even if life without parole isn’t struck down for all juvenile offenders, maybe for those convicted with a felony murder. There are all these related issues that we see coming up that some of which Christopher and I have mentioned. One the fact that in some states, these sentences are being replaced by very long term sentences. So if you say you can’t have life without parole but you get a 40 year sentence, is that really a meaningful opportunity to obtain release which is what Graham required. And I think the question about parole and actual release for these men and women who are serving, if it does go to the parole board, again with what Christopher said, what are the factors that the parole board should be considering? And some states were really concerned with the seriousness of the offenses and the early behavior of these people when they were first incarcerated may be strong factors that will deny them that opportunity for parole even if in their later years, they really have rehabilitated. Bob Ambrogi: Go ahead, Christopher. Professor Christopher Slobogin: I would add in addition to the very long sentencing Emily was talking about, there are also these so called de facto life sentences. In other words, the person is convicted three counts of a crime and gets three times 50 or 40 years. That is a life sentence if it is imposed consecutively. And those sentences can still be imposed but I think they can be challenged after Miller and Montgomery. I think actually staying within the juvenile context, there’s also a pretty strong argument now that any formal mandatory sentence is impermissible. And here I’m even talking about a 20 year sentence that’s mandatory, because it doesn’t allow the juvenile convicted to show that they’ve changed. And finally, as I’ve already mentioned – and this is really stretching it but that’s what we academics do is try to stretch doctrine – I think all of this could apply to people convicted for crimes they committed for adults because adults can change too. Bob Ambrogi: Well, that will be a case to watch for, for sure. We’re just about at the end of our time. I do want to give each of you an opportunity to give your closing thoughts on this and also if you would like to let our listeners know how they can learn more about your work or follow up with you if they’d like to do that as well. So, Emily of the Juvenile Law Center, why don’t we start with you? Emily C. Keller: Thank you so much for having me. Montgomery really has presented this huge opportunity and followed this line of cases that have shown that kids are different for the purposes of sentencing, and I think a lot of work lies ahead in making sure that Miller and Montgomery are meaningfully implemented. I work in Pennsylvania and across the country and have met with hundreds of people serving a sentence and have seen the progress these men and women have made. And I’m really hopeful that they get this chance to get released and to give back to society in the way that they’ve been hoping for, some of whom for decades. So again, thank you for having me and if you’re interested in this issue and you want to learn more, Juvenile Law Center’s website is www.JLC.org, and you can contact me. My number is (215) 625-0551. Bob Ambrogi: Thanks Emily, and congratulations on your success in the case. Christopher Slobogin, your final thoughts. Professor Christopher Slobogin: I want to thank you also for having me and again I want to congratulate Emily for success in Montgomery. I’ve pretty much said my piece as to what I think the implications of Montgomery are. I think one more sort of larger perspective on this series of cases is we see the courts starting to flex its muscle in the 8th amendment area. And with Scalia gone, I think we might even see more of that going on at the Supreme Court level. It will be very interesting to see what develops within 8th amendment jurisprudence as a result of this series of cases. I can be reached or if someone wants to reach me, I could be reached through Vanderbilt Law School. It’s easy to find on the internet. My book, Juveniles at Risk, as Bob mentioned, should be available somewhere probably on Amazon and it sort of sketches out some of the things that Emily and I have been saying. And again I appreciate having been asked to be on this program. Thanks very much, Bob. Bob Ambrogi: Thanks to both Emily C. Keller, supervisor at the Juvenile Law Center in Philadelphia and Christopher Slobogin, director of the criminal justice program at Vanderbilt Law School for taking the time to be with us today and share their thoughts on Montgomery v. Louisiana and what it means both going forward and retroactively. I really appreciate your thoughts, thank you for being with us. Emily C. Keller: Thank you so much. Professor Christopher Slobogin: Thank you. Bob Ambrogi: That brings us to the end of our show. This is Bob Ambrogi on behalf of J. Craig Williams and everybody at the Legal Talk Network; thanks for listening. We hope you’ll join us next time for another great topic. When you want legal, think Lawyer 2 Lawyer.